Team Two is Tyler Kuhns, second-year imaging science, Hamburg, N.Y.; Ryan Hartzell, second-year imaging science, Danielsville, Pa.; Zachary Assenmacher, second-year physics, Danielsville, Pa.; Jeff Maggio, second-year imaging science, Cincinnati, Ohio; Nate Dileas, second-year imaging science, Buffalo, N.Y.; Emily Faw second-year motion picture science, Sellersville, Pa.; Catherine Meininger, second-year motion picture science, Oklahoma City, Okla.; and Kristina Carucci second-year imaging science, Massapequa Park, N. Y. Faculty advisors are imaging professors Harvey Rhody and Joe Pow. Two teams of undergraduates from Rochester Institute of Technology beat out universities, companies and individuals from around the world and had their preliminary designs accepted for the SpaceX Hyperloop Pod Competition Design Weekend. Of the 1,200 designs submitted, only 318 teams from 162 universities in 16 countries are advancing to the first phase of the design process and presenting their unique designs Jan. 29-30 atTexas A & M University. The Hyperloop is a futuristic high-speed rail system with multi-passenger, solar-powered “pods,” or capsules, speeding through a series of depressurized tubes. Elon Musk first proposed the Hyperloop idea in 2013, and his company, SpaceX, is one of several seeking to accelerate the development of a system prototype. He proposed a national challenge—to build a scaled-down pod model and necessary sub-systems. After several competition phases, Musk intends to hold a final contest in June at SpaceX headquarters in Hawthorne, Calif., where a Hyperloop test track is being built. 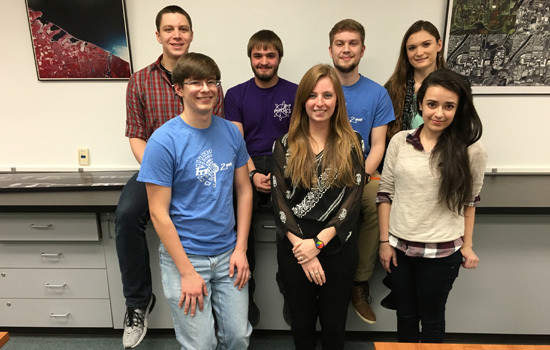 Trying to get from this first design phase to the finals are two groups of undergraduates from RIT’s Kate Gleason College of Engineering and the Chester F. Carlson Center for Imaging Science. All are only second or third-year students who have yet to start co-ops or major design projects within their programs, but who believe their Hyperloop ideas have the potential to make an impact on high-speed travel, said Willow Baker, a mechanical engineering major and leader for RIT Team One. “This whole competition is just a large brainstorm for this really huge idea. Get as many minds on a problem as you can, and it’s going to be solved that much faster, with that many more different approaches to the problem,” Baker said. The six engineering students she is working with are designing a full pod. They are fine-tuning a full proposal complete with designs for the levitation system with a flexible barrier they call the “skirt” to maintain the air bearings, and a modular regenerative braking system. “We were able to make comparisons for our system to other things we found in the real world like the takeoff and landing gears on airplanes, or like an air hockey table with the little openings that release air and try to trap the air under the game pieces so that they levitate. The Hyperloop is a new application that combines a lot of pre-existing technology,” said Baker, who is from Blue Bell, Pa. Teams have the option of presenting a full-pod proposal or details related to one of the Hyperloop’s sub-systems. They will be required to present a working prototype plan, as well as the process to build the equipment, materials used and cost estimates for manufacturing the pod. They will be judged by university and corporate engineers. Led by Kristina Carucci, RIT Team Two developed two sub-systems: a high-speed communications system and a sensor system to detect faults in the walls of the tube that could impede the motion of the pod. Both are relatively new technologies being enhanced so they can be applied to a higher speed environment, she said. “It is an entirely imaging-based method. Other traditional methods that are used to scan tubes, like oil pipelines, would not work in this case,” said Carucci, a second-year imaging science student from Massapequa Park, N. Y. “Scanning the walls of the tube will use what is called ‘structured light,’ and it is commonly used to make 3D maps of stationary objects for scientific purposes. But it has never been used at such high speeds. Each of the teams had access to faculty from their colleges and took advantage of that expertise to learn more about successfully building mathematical models and to act as panelists similar to the ones that will question them at the Challenge in Texas about their new technologies. Over RIT’s holiday break in December, both teams will finalize designs, cost estimates, specifications and 3D models of components as well as simulations to verify that designs could work. But futuristic models still have some real-world concerns. As both teams refine design specs they are also strategizing how to get to Texas for the competition. Managing prescribed budgets for a project plan is different than finding funds—and each team recognized that it is a different skill set and that they could be successful if they joined forces.